One of my daughter’s and my favorite activities is to take a walk around the neighborhood or a local park and see what we can find that is bright and colorful. When we lived in Texas, there were a couple of pine trees in the neighborhood and over the years, we collected quite a few pine cones. One year, we decided to make “art” out of what we found. My daughter wanted to make a pine cone princess and what you see in the picture is our creation. This fall craft would make a beautiful and inexpensive fall decoration or part of a center piece for your Thanksgiving table. You could make one for each member of the family and use it as a place holder, too. Every year we also make a cornucopia of fresh gourds and fruit, and we love to include fall leaves, pine cones and acorns as part of our decoration. Fall leaves of different sizes, shapes and colors. Magnolia leaves and oak leaves are very sturdy and will last for a while. Leaves that are still slightly green or fresh will work better than leaves that are completely dried out. 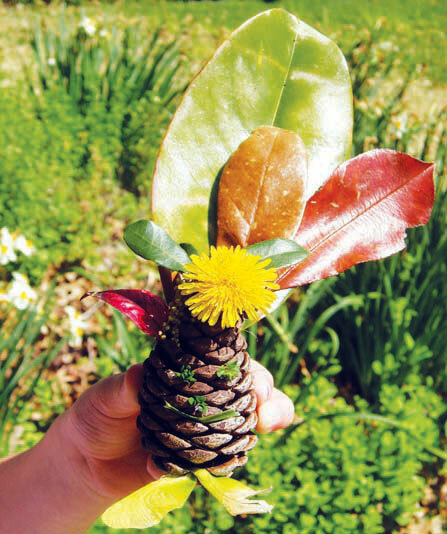 We used a dandelion for the head as they are all over our neighborhood but you could use an acorn, leaf or rock, anything that sparks your child’s imagination. Seed pods. Many Texas trees produce seed pods of different kinds, see what you can find. Hot glue gun. We just stuck the leaves and pieces down into the pine cone but if you want this to last longer, you can hot glue the different pieces into the pine cone. Let your child decide where to put the different parts. This fall craft is basically free or cheap to make and just requires time and imagination. What a great way to carve out some quality time with your kids and enjoy the beautiful fall weather!